This liquid soap is made by traditional ways according to the Marseille method. Cooked in a cauldron, it is rich in organic fair trade argan oil with nourishing and protective properties. Naturally glycerinated, it gently cleanses your hands and body. 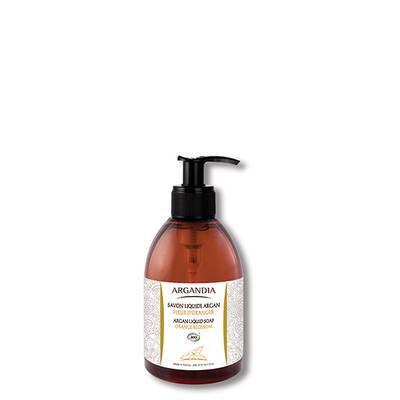 Argandia Liquid Soap with organic fair trade argan oil is suitable for all skin types, it cleans hands and body with infinite softness, while keep the skin balance. Apply a small amount of liquid soap to damp skin, massage and then rinse with plenty of water. The use of a sponge will increase the volume of fine foam. Then apply the body milk for normal to mixed skin and precious oil for dry and sensitive skin.